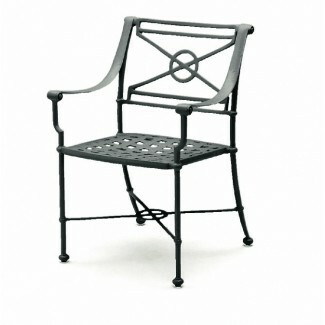 Our Delphi Arm Chair is fully welded using cast and extruded aluminum for rust free, non-fading structural durability and low maintenance. Ergonomically designed for comfort while keeping style and artistry in mind. Materials used make this chair 100% recyclable. Finish options include: Bronze, Ivory, Madera, Mahogany, Patina, Pebble, Pewter, Satin Black, Satin Green, Textured White, and Verde.